Welcome to Tea and a Sewing Machine’s first ever sewalong! I’m very excited about this and I hope you enjoy making the Cherry Blossom Dress. You did sign up for the emails didn’t you? If you did, I sent you some printables and you’re going to need the one that looks like this. If you didn’t, don’t worry! You can still sign up for the emails here. You’ll also need your tape measure and a pencil. A friend or a mirror is also useful. You might find it easier if you have somebody to help you. If you don’t, consider using a full length mirror so that you can check that the tape is straight when you are measuring. When taking your measurements, don’t wear anything baggy or bulky! Leggings and a vest top or a close fitting tshirt are best. A good quality plastic tape measure will be most accurate. The fabric ones sometimes stretch a bit, especially over time. When measuring from your waist or your hips, dangle the tape measure so that the start of the tape measure is at the bottom. This will make it easier to read your measurement. Keep the tape loose and don’t pull it too tight. You want to be able to breathe! It’s always easier to adjust something that is slightly too big than too small. Waist, where the tape measure rests comfortably. Top of your shoulder to your armpit. 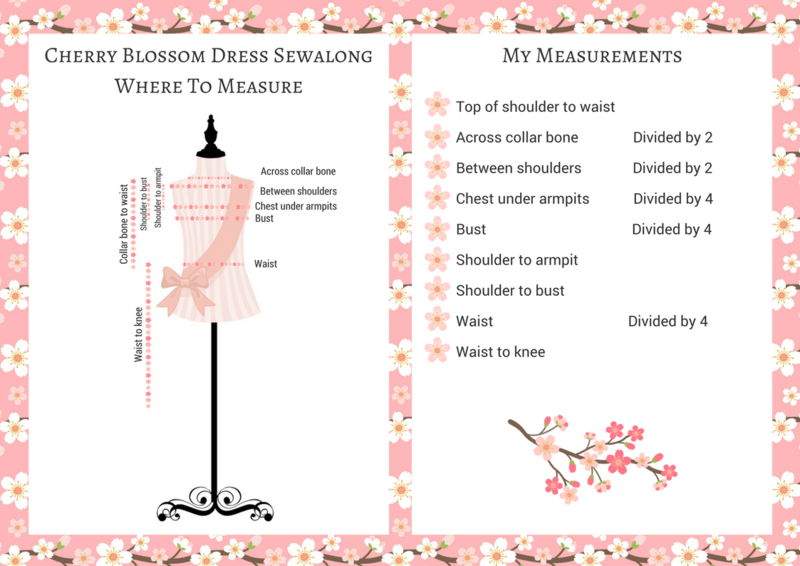 You’ll need to measure under your armpit because this is the measurement that will determine whether the armholes of the dress are big enough! Top of your shoulder to where you took your bust measurement. From your waist to just below your knee. Record everything on your printable and put it in a safe place. You’ll need it on Friday when we draft the pattern pieces for the bodice! Yes and yes :). You’re alright as you won’t need the material before Friday anyway. Glad you’re taking part! I’m really happy as I’ve found an amazing bargain king size 100% cotton duvet coverfor possibly two dresses. I was looking to pay on Instagram but can’t see you on there and therefore I can’t see a sewalong tag either. I’m a bit confused (it doesn’t take much!). You don’t have to pay to do the sewalong.